When I reviewed the Fujifilm x100, I was impressed by the DSLR caliber image quality but disappointed with all of its quirks for the price charged. The Fujifilm X100S Digital Camera is the result of a lot of user feedback and improvements. As a result, this camera looks the same but it is very much different on the inside – in a very, very good way! I like to use car analogies, so I’m going to use one here. If this camera was a car, I’d call it a modern day Maybach. For those who don’t know their cars, that basically means it’s on the same level as a Rolls Royce (think Leica) but made by someone else. Just like the luxury cars, you can argue that it’s a lot of money for something you don’t really need – even if you can afford it. However, purchase sometimes go beyond all reason and logic and are purely motivated by emotion. This is where I think the x100s sits, and if I had the money I’d buy this camera in a heartbeat despite my logical side telling me – WHAT? Are you nuts?!!! Here’s the deal – the image quality of this sensor is impressive. The in-camera noise reduction is very bad (crushes details), but you should be always shooting with RAW enabled anyway. Now that Lightroom 4.4 & up has a demosaic algorithms for Fujifilm cameras with the X-Trans sensor you can get a great RAW image, use Noiseware to kill the noise without destroying the detail and end up with all the benefits of not having a low pass filter without any penalty. This means stunning images are possible, so take the great sensor and brilliantly sharp lens and you’ve got something special here. Of course my logical brain says “but this is a $1300 camera with a fixed lens”!!!! I can’t let that go by, but damn it sure is a fun camera to use! It’s hard to explain until you spend time with it, but this camera just has tons of charm. Perhaps it is ability to do so much in-camera that you feel like the LCD is showing you a great print from the film days, or perhaps it’s just the challenge of being at 23mm only. Whatever it is, I want one and don’t look forward to sending this one back to B&H! Read on to get more of my thoughts on this much improved camera. 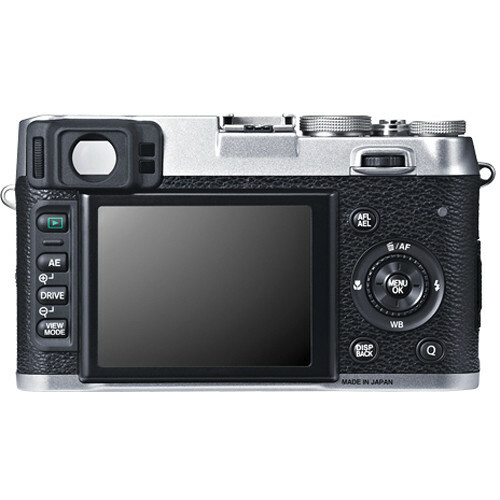 Just like the other new X-Series cameras that I have reviewed recently, the only big changes are the swap of the AF point and drive buttons and the Q button replacing the RAW button. Everything from the same trick Hybrid Viewfinder (which has been upgraded to 2,360K-dots) to the great lens is going to be familiar to X100 owners (or admirers). There’s lots of improvements, but the biggest is the removal of the low pass filter (think D800E & D7100) which allows for significantly improved image resolution from its super sharp lens. However, the thing that any X100 owner will want to upgrade to the x100s for is the improved AF system. In short, this one works and it works VERY well! Thanks to a new system that uses BOTH phase detection (think DSLR’s) and contrast detection (think sucky x100), the AF problems are mostly gone. Indoors worked very well and only the toughest of conditions that trip up your average DSLR were an issue. Manual focusing has been drastically improved with a nice live view implementation, focus peaking and Digital Split Image (DSI). As a result, I had no issues and was very happy with the AF system of this camera. The wonderful digital viewfinder works extremely well too. I don’t have a sever where I can store the RAW images. If you have an image where you really want to see a raw, then contact me and I’ll do what I can to try to get you the RAF file. What you see on your camera LCD, and what you make decisions based on the histogram is the in-camera JPEG – even if you shoot RAW. As a result, a lot of opinions are formed based on that JPEG (which is even embedded into your RAW file). To compare apples with apples and what the camera can do I think it makes sense to compare the RAW as you can always get better results that meet your needs with a RAW file, so it effectively only gets better from here! While I always shoot RAW, I also prefer to shoot RAW+JPEG and use the JPEG when it’s not a commercial shot. This camera creates gorgeous JPEG’s, and not everything I take with it is intended for my portfolio nor will every image get hours of Photoshop love. As a result, if I can get an image I love out of camera, isn’t that a good thing? I think it is and I think many cameras today do that, so why not place a value on a feature of the camera? If you want to pixel peep raws, go to DPReview – they have more people and can do a better job for pixel peepers than I have the bandwidth to do. My shooting style with this camera is mostly aperture priority (which on this camera means I pick a fixed aperture and set the dial to auto shutter speed). I also use Auto (6400) for my ISO. I shoot in RAW+F(ine) with DRAuto or DR400 and WB Auto. I’m also very fond of the Velvia (Vivid) film simulation as I enjoyed Velvia film. If you think the image is a bit too punchy and black then blame my film simulation selection. I like Astia (Soft) quite a bit too so if you see some images that are less punchy then that’s what I’ve chosen and if they are pretty neutral then I’ve chosen Provia (Standard). I always pick my AF point when in S(ingle shot) AF mode, and I choose the medium or large AF point indoors as the small AF point is near useless in anything but great light. Continuous focus works well both in single shot and burst mode. All images copyright Ron Martinsen – ALL RIGHTS RESERVED. You may view, but you may not edit print, or publish any of these photos in any way without a signed contract. All images are exactly as they came out of the camera – zero post-processing, cropping, or anything. All in-camera processing was via camera settings and not in-camera editing. Nearly all outdoor shots were taken in light rain and mild wind conditions, so some softness is wind related but most of it is due to poor in-camera noise reduction. Use Noiseware on your RAW files instead. and this suggests they’ve certainly done something beyond removing the low pass filter. Are you s**ting me? This is a little compact range finder? It looks almost 3D like to me. I SO wish I had more time with this camera! Yes, it’s easy to get addicted to f/2 with this camera! Try to get this shot with the last generation Fuji’s or many DSLR – HA! Good AF has FINALLY arrived to the Fujifilm X series – woohoo! In typical Fujifilm fashion, this camera takes brilliant panos. However, the tough conditions and handholding forced me into using a shallow depth of field aperture which ruined the shots. That said, the stitching was excellent under tough conditions. I’d certainly recommend a tripod and f/5.6 or greater when doing panos whenever possible. Unlike the X20 which supports 360 degrees, this camera only supports 120 & 180 degrees. Honestly that’s all I used on my X10 so I’m plenty happy with that. I’m just impressed with how well it works! One minor observation I noticed is that the playback speed and smoothness (fps) of the X100s wasn’t as good as the X20. I assume this is just due to having more megapixels and close to the same processing power. It’s not bad by any stretch – just a little slower. Overall I was impressed with the DSLR-like quality, but like all DSLR’s it’s not a camcorder-like video device. Like other Fujifilm of this generation it also has some pretty nasty compression noise that really demands perfect light and external audio for the best results. However, I think the casual video enthusiast will be happy simply because the sensor and lens of this camera are so darn good that you are sure to get some great footage when all the filming conditions are perfect. This shot floored me and made me think – yeah, good times are ahead for our DSLR’s too! This has to be one of the best bookshelf shots I’ve seen at an aperture greater than f/11. I wouldn’t say Fujifilm has eliminated diffraction, but they’ve done something magical that I hope spreads throughout the industry! If you own a X100 then sell it and upgrade to the x100s*. You’ll finally get the experience that you were hoping for when you bought the X100 – and then some. Seriously, there’s so many improvements that it only looks like the same camera. Now I used an asterisks (*) because I still think that everything we see in this camera moved to X-E1 replacement is going to be the ultimate Fujifilm camera experience. I want interchangeable lenses and I don’t want the X-Pro1 price, so I think the X-E1 replacement is going to be huge. This isn’t the perfect camera, but as of April 12, 2013 it’s the best Fujifilm camera I’ve tested to date. It’s also a hell of a lot of fun to use which is probably why I was sorta ho-hum about the D7100 I just reviewed. These are very well done sites that give you a lot more info about this camera in a way that will have you wiping your chin and placing your order at B&H. There’s plenty for geeks too, so trust when I say that these will make you toss logic to the wind and just order one. I had one in my cart several times, but found enough resolve not to pull the trigger. You might not be so lucky! I highly recommend this camera for those with lots of extra income who are looking for a third or fourth camera. I still can’t in good faith recommend it for a beginner or single camera owner, but I can say that those who spring for it will love it. Click here to order the x100s B&H web site. My friends at Adorama have it online here. Come on! buy the fujifilm x100s is amazing ! A x100s Fuji Sony rx1 or which you choose. The x100s would be my preference because of the usability of f/11 and beyond and the gorgeous in-camera JPG's. I can live without the full frame.